After a September 1961 appearance on The Today Show, Jim got a call from the William Morris Agency offering to represent The Muppets. This was a big step toward becoming more nationally recognized and opened the door to expansive opportunities. 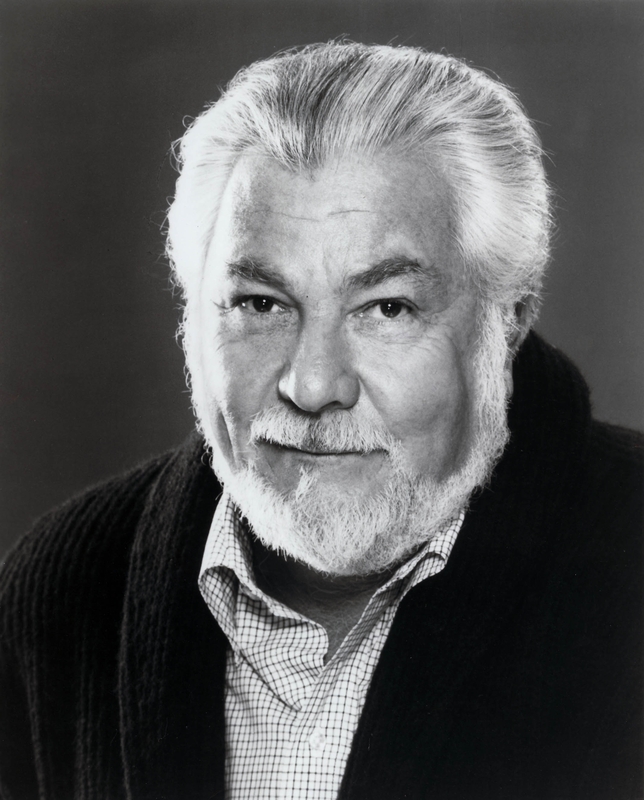 A young executive at the agency, Bernie Brillstein, took on Jim and his characters and set out to make them stars. It was through his efforts that Rowlf landed the job with The Jimmy Dean Show and began appearing regularly across the television dial. 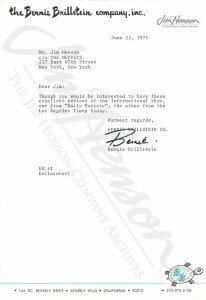 In 1964, Brillstein branched out to work with Marty Kummer and Jerry Weintraub under the corporate banner of Management 3 and signed Jim as his client. Brillstein spent the 1960s marketing the Muppets to variety shows and pitching other projects developed by Jim and Jerry Juhl that ranged from experimental television specials to live-action feature films. He created a summer variety show in 1967 called Our Place and made Rowlf a lead, introducing him to other celebrities like Carol Burnett. When Brillstein went out on his own the following year, Jim went with him. 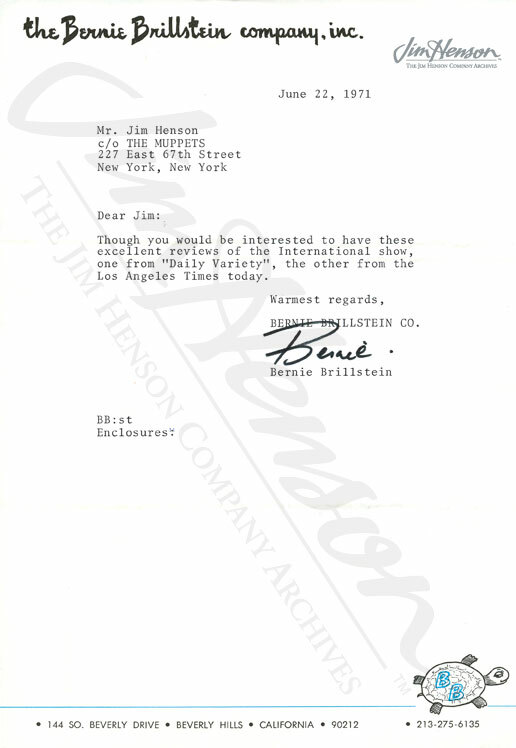 Brillstein got Jim meetings with network executives to discuss a Muppet series and sold them on one-off Muppet specials. In 1975, Brillstein sold Saturday Night Live to NBC, making sure that there was a place for Jim’s creations that first season, and cementing access to a host of young talent that were connected with the show. Between the comic actors and guests of SNL and his other clients, Brillstein’s contacts made finding guest stars and cameos for Jim’s projects relatively easy. With great mutual respect, the relationship between Jim and Brillstein weathered an array of business arrangements over the years. Brillstein represented Jim in various capacities for most of his professional life, and Jim expressed his appreciation in many ways. 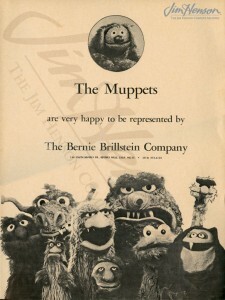 As a token of friendship in 1973, Jim had a Kermit-headed turtle made by his workshop as a gift, reflecting Brillstein’s company’s logo which featured a turtle. Jim’s affection for Brillstein was memorialized in The Muppet Movie – the opening scene where Kermit is first tempted by the silver screen features a Hollywood agent lost in the swamp named, appropriately enough, Bernie. Brillstein returned the tribute in 1991 by co-hosting the dedication of Jim’s star on The Hollywood Walk of Fame. 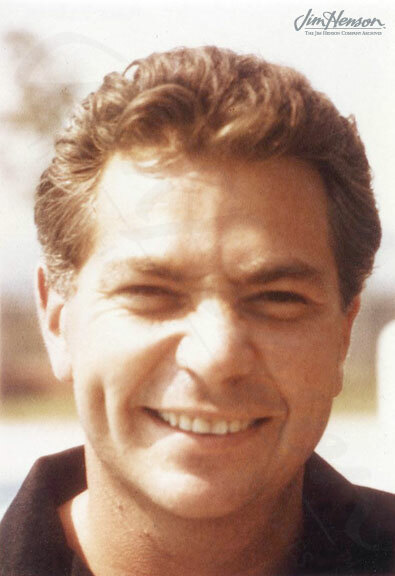 Bernie Brillstein in the 1960s. When Brillstein went out on his own in 1968, Jim showed his loyalty by taking out this advertisement. Letter on The Bernie Brillstein Company stationery featuring his turtle logo, 1971. This entry was posted in 09-September '64, 1964, Muppet Show, Muppet Specials, Saturday Night Live, Uncategorized and tagged Bernie Brillstein, Jerry Juhl, Rowlf, Saturday Night Live. Bookmark the permalink.